The GITZO Adventury Backpacks are new premium bags have been designed to provide long-lasting comfort and safeguard all the equipment required by professional bird, wildlife, nature and landscape photographers. Gitzo, a pioneer in some of the most advanced, revolutionary technologies for professional camera equipment, is pleased to introduce the GITZO Adventury Backpacks. These new premium bags have been designed to provide long-lasting comfort and safeguard all the equipment required by professional bird, wildlife, nature and landscape photographers. 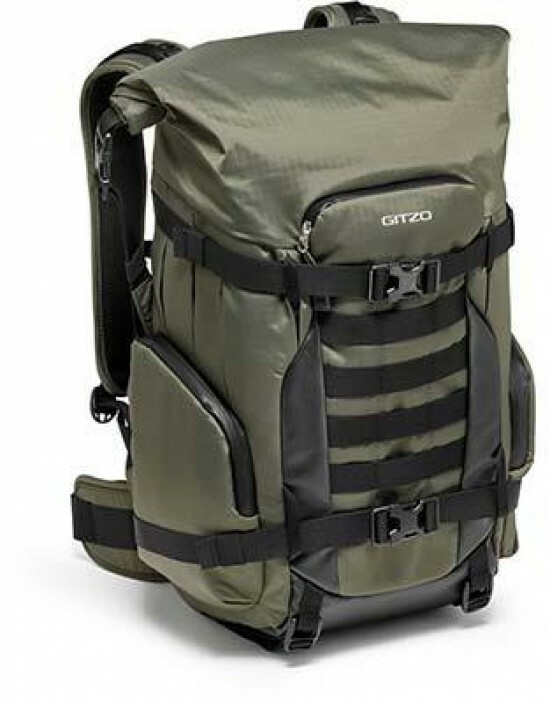 The new GITZO Adventury Backpacks are available in two versions: the 45L and 30L. They are both made of premium weather-resistant materials and are designed to safely carry CSCs and DSLRs with long lenses and provide their users comfort and effortless access from the back and side. Gitzo initiated the outdoor photography era by combining performance with the freedom to embrace creativity. Today, the centenary brand continues to set new standards of excellence in the market. The GITZO Adventury 30L Backpack safeguards a pro DSLR (such as a Canon 1D Mark II or Nikon D5) with a 70-200 mm f/4 lens attached and a second camera body plus up to 4 lenses or up to 400 mm detached f/4 lens, a camera body and a couple of lenses or small accessories. Its interchangeable dividers also enable it to fit a full premium CSC set up (such as Sony Alpha 7/9 Series) plus foldable drone and remote control with accessories (i.e. DJI Mavic Pro series). The GITZO Adventury 45L Backpack is the perfect solution for bird and nature photographers wishing to carry their complete photography kit in a single, outdoor-ready bag that is secure, roomy and feature-rich. Thanks to the new GITZO G-Cushion, the pack protects a pro DSLR (such as a Canon 1D X Mark II or Nikon D5) with up to 600 mm f/4 telephoto lens attached, plus a second camera with lens attached and additional lenses. Its interchangeable dividers can also be configured to fit a DJI Phantom Drone plus remote and a camera with lens attached, additional lens and accessories. Both new models feature a smart photography insert that can easily be removed whenever users are not carrying photography gear and require an everyday pack. A clever back opening ensures the gear’s maximum security, enables effortless use and helps keep the pack clean and dry. Each model also accommodates a laptop up to 15” (MacBook Pro 15”) and a tablet (iPad Pro 12,9”). The Gitzo Adventury backpacks also feature multi-link straps that can connect a big tripod such as the Gitzo Systematic series on the 45L or the Gitzo Mountaineer series on the 30L, or a variety of accessories on the front and side, by simply configuring the daisy chain system. The adjustable ergonomic shoulder straps and a ventilation system on the back allow for maximum comfort. Thanks to the Expandable roll-top, which accommodates personal accessories, Gitzo Adventury users can carry everything they need for their bird, wildlife, nature and landscape photography adventures. Coated zippers, water-repellent fabric and a coated bottom section make this bag suitable for use in the most humid environments. There is also a rain cover for extreme weather. The Adventury backpacks’ colourway is designed to blend in with the natural surroundings. Professionals the world over acknowledge Gitzo tripods, monopods, heads and accessories as setting the industry’s standards for excellence. Innovations such as the first uses of carbon and basalt fiber to make tripods and magnesium to make heads, matched with a design policy of “no gimmicks and no compromise on quality,” put Gitzo products in a class of their own. Gitzo’s carefully crafted products form a comprehensive range of supports for large, medium and small format cameras, for film or digital technology, for still photography or dynamic video, for studio or location work. Precision assembly, high quality materials and fine control are all qualities that represent Gitzo products.